The Shaun the Sheep Movie 2: Farmageddon trailer introduces Mossy Bottom Farm to a lost alien named Lu-La. The gang is back and it looks like they're all in for the adventure of a lifetime, thanks to Lu-La's arrival. Since there isn't really any dialogue in the sequel, the trailer relies on some narration to set the stage for what were all in for when the stop-motion animation sequel hits theaters in December. Shaun the Sheep Movie 2: Farmageddon centers on Lu-La the alien, who has amazing powers and crash lands near Mossy Bottom Farm. After a pretty hilarious scream-filled introduction, Shaun the Sheep soon sees an opportunity for alien powered fun adventure, setting off on a mission to send the intergalactic visitor home before a sinister organization can capture her. The trailer successfully sets the stage and hints at all of these elements, from trying to get pigs to fly, a small E.T. parody, and other hijinks. Aardman Animation's Will Becher and Richard Phelan co-direct Shaun the Sheep Movie 2: Farmageddon. The sequel was first announced back in 2015 after the success of the first installment, but did not go into the pre-production phase until January 2017. 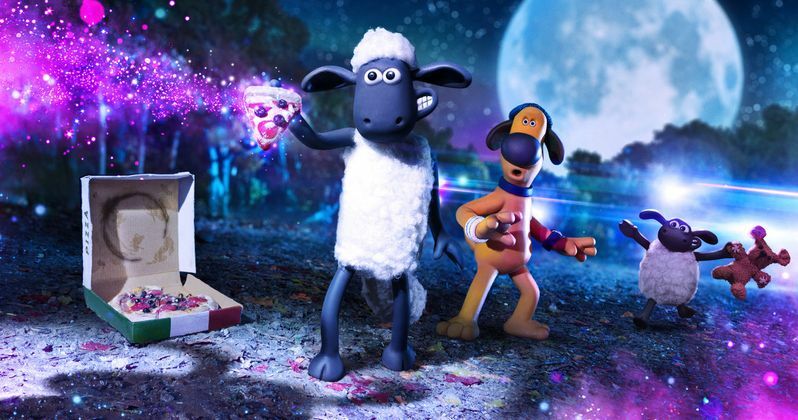 Since then, fans of Aardman Animation, who also made the massively popular Chicken Run and Wallace & Gromit movies, have wondered what Shaun the Sheep Movie 2: Farmageddon was going to be about. Thankfully, we finally have an update and the first official full-length trailer. Fans of the first installment should be pleasantly surprised with the latest trailer and how it incorporates something new into the franchise. In November of 2018, Aardman Animation founders Peter Lord and David Sproxton decided to transfer ownership to their employees in an effort to remain independent. The duo made the decision to do so after thinking about becoming a larger studio's asset to sell off down the line. Instead, Lord and Sproxton are keeping it all in the family by sharing the studio with its employees. The studio has been up and running since the 1970 and it's more than just a business for the co-founders. Shaun the Sheep Movie 2: Farmageddon hits theaters North American theaters on December 19th and opens up in the United Kingdom on October 18th, with release dates in Germany, France, and in Australia and New Zealand being September 26th, October 16th, and January 9th, 2020 respectively. Aardman Animation looks like they have another hit on their hands with the upcoming sequel. As for Chicken Run 2, it was officially announced in April 2018, but we haven't seen an update in a while. With that being said, these stop-motion animation projects take a lot of time and effort to come out looking as good as they do. You can check out the trailer for Shaun the Sheep Movie 2: Farmageddon below, thanks to the Shaun the Sheep YouTube channel.